Climate Scientists Speak up or we WILL hear you! While sitting here with my son, I took a moment to look around blogland and noticed Climate Audit has come out with what I consider a proper response to the rubbish science recently swept to the corner by the UK parliament. In fact, it has got to be the strongest worded post I’ve seen from CA. Take a look here. The post is titled “Tricking the Committee” but of course we all know that nobody was tricked. Since everyone knows we’re being lied to by the politicians and the scientists at the center of the debate, what I want to know is where are the honest climate scientists? Why aren’t the honest scientists standing up for good science? Is it that ALL climate scientists support corruption for a common goal? Do they fear Jones and Mann soo much? Are they just more interested in the extremist political solutions for the globe than true science? Where are the Judith Curry’s who would speak out? It should be such an obvious thing to do, reject bad “hide the decline” science and push on toward good. Yet all the biggest names in climate science are silent! Same response to Mann’s annual hockey stick debacles. We are not fooled by political reviews. Hell this review put the intended expenditure of “trillions” of pounds toward mitigation right in the summary. Today The House of Commons Science and Technology Committee released their report on climategate emails. Professor Jones et team were exonerated from any wrong doing. No big surprise there but oddly I’m a little busy right now with my newborn. My wife and I thank you for the wishes everyone. So with that in mind, I’ll post here, the summary, a link to the full report and some thoughts below. This is a guest post from Ryan O. Ryan was principle author of our submission on Antarctic temperature reconstructions which used PCA based methods for combination of satellite and surface data. This post has some very loose basis in that work. When I first learned of ‘teleconnections’ it was at Climate Audit while looking at some paleo papers. I thought it was a joke but quickly figured out that it was real and based on the potential for weather patterns in distant regions to be related/correlated. For instance, if you have stable prevailing winds over long distances and time. (i.e. E-W over the US). You might find some kind of connection with the weather in Chicago to the farther west- Iowa but less to to the south or north. This is about as simple as it can be stated, b/c some suggest negative teleconnections, polar ones, and all kinds of wild stuff. PCA analysis in data with spatial correlation will bring out patterns similar to vibrations on a drum head. Because the patterns in the drum head aren’t perfectly symmetric from climate data, it’s easy for the human mind to attach spurious climate meaning to them. In this post Ryan used VERY general properties of satellite data to create an otherwise random synthetic data set and then created nearly identical PC patterns to the actual climate data as measured by UAH. One of the favorite concepts popularized by climate science is that of the “teleconnection”, where large-scale dynamics are inferred from inspection of patterns resulting (primarily) from EOF or PCA analysis. These patterns are assumed to have physical meaning, either directly or indirectly. The concept is used in certain paleoclimate reconstructions (such as MBH 98) where proxies are assumed to “teleconnect” to the average earth temperature. It also appears in some climate-related EOF/PCA texts and in analyses of atmospheric pressure, precipitation, ocean current, and a myriad of other related topics. Given how pervasive “teleconnections” are used to study our planet, one might assume that they have a solid theoretical foundation. As with other things in climate science, one would be wrong. The issue of teleconnections and physical meaningfulness has come up here before – most notably with the work on the Steig Antarctic temperature reconstruction. The primary point of contention there was that Steig limited his analysis to the first 3 eigenvector pairs by using the “physical meaning” argument and a sampling error argument from North (1982). Steve McIntyre showed that very similar (and physically non-meaningful) patterns result from EOF analysis on an object shaped like Antarctica with exponential correlation functions and precisely zero physical dynamics. An article from the morning call which requires a bit of translation. I don’t know how they do it with a straight face, but in my opinion the mann has a personality disorder. My comments below are in Red the article is in black. Below we learn that Keith Briffa of climategate agreed to delete emails “Keith will do likewise”!! I find it difficult to reconcile “I’ll contact Gene about this ASAP” with — “I didn’t think it was appropriate”. I’ve started a new surface temperature documentation page. Currently it contains only Roman’s offset global anomaly calculation but I will be adding to it periodically starting with a standard anomaly style calculation. If people have links to different raw and finished data and methods, I would like to collect them on that page. Leave suggestions below and I will add a data section and just gradually work at making it a better source. Unzip them to the folder of your choice using a free zip software, and point the variable folder to the folder you chose. In addition to the above output, the array gridtem holds the temperature data in a 36 x 72 x columns matrix. The data is not anomalized but can be accessed for further processing at that point. 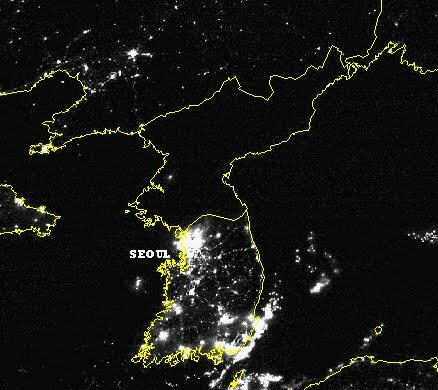 From WUWT, North Korea takes the gold in Bobsledding, hockey, 100 meter butterfly, nope– Earth hour. Congratulations to the world leader in not consuming electricity. Nothing like a planned economy to make things greener. By email, I received anonymous notice of a complaint against GRL which seems to indicate Climategate style business as usual at their office. This is with respect to a paper submitted in July09, well prior to climategate, a rebuttal by Foster (Tamino) and crew, and a rejected reply by the original authors. I would love to slam the team one more time, because they are what they are, however in this case they don’t appear to be wrong in their critique of the paper. Of course correctness doesn’t excuse the incestuous behavior which seems to continue at GRL in the post Climategate world. The boys really, aren’t listening to us in any way at all. An article at Icecap covers most of the points. Authors denied the right of reply. There are several links in the discussion but the crux is, publish a paper which shows much of global warming can be explained by ocean currents, angry taminoesque critique published as a reply and authors attempted defense rejected. What makes it interesting is that some of the behind the scenes discussion of this paper was shown in climategate emails. Tom Fuller’s blog has me on a roll this morning. Tom has an economist which he interviewed who calculated that the best way to save the world is to tax CO2, and Copenhagen is a good thing. Naturally, that get’s me all wound up but I can’t finish my thoughts there without running into the character limits of the examiner. There is so much wrongthink in this world, it cannot be fought. Too many who believe the best solution for everything is government and there is nowhere left on earth for us free-market conservatives to hide. My point, made here so many times is the same. The IPCC foolishly determined that CO2 has a huge life span in the atmosphere. I say foolish because it’s not based in sound science and it creates a big logic problem. According to the IPCC the CO2 is cycling in and out of short term sinks for thousands of years before being absorbed into a long term sink of some kind. Critter shells are popular long term sinks now. If we accept this, then the total summed output of mankind today will affect temperatures for thousands of years. These long residence conclusions appear to go against the raw data, but data doesn’t stop climate science these days as evidenced by ‘hide the decline’ and Mick Kelly’s far less famous, apparent trimming of more recent declines in temperature graphs. This is basically a continuation of the documentation of Roman’s improved method of combining temperature anomaly. First there are several plots which show the difference between the simple – average the anomaly method – used universally in climate science overlaid on the improved method. Figure 1 - Two plots of global temperature anomaly. Red is the standard method used in climate science, and black is the improved method. Note the slightly higher trend in the black method. This is created by the required offset corrections for incomplete temperature stations. Looking back, it’s kind of funny, I wouldn’t even calculate an Antarctic trend without the offsets. Nobody had to tell me, hey Jeff you should….. it’s obvious!! They are a conceptual necessity in calculation of a global trend. The more I consider it, the more idiotic it seems that climate ‘science’ doesn’t do it. It’s a bit late for proposals, but this is David’s ideal health care system. Feel free to negotiate. This may be way too late given the recent events at our nation’s capital, but I hope not. As I mentioned in my post on the People Dependent thread, I had already sent these ideas to a main-stream media outfit. They have not responded to date, which does not surprise me. But even if they do, I realize now that it would be best if these important topics are debated in public. Ok, today is the day that tAV, the repeatedly alleged EVIL denialist blog, lucky unwitting recipient of the biggest scientific scandal of the last hundred years, hosting the proprietor who has been snipped from every advocate website, who will now present a global gridded temperature from the RAW-ish GHCN data, having a higher trend than the believers will publish. However, it is to my knowledge a more correct representation of the actual data. 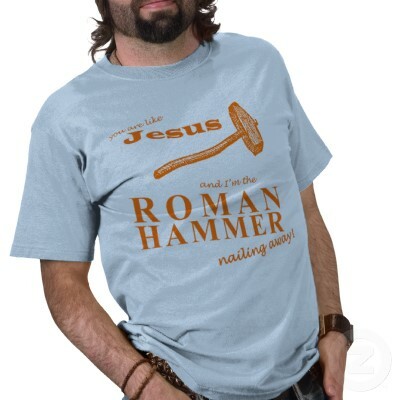 To perform this feat of magic, we’ll use Roman’s hammer, so popular it has been immortalized in a t-shirt. Roman’s hammer, is a simple method for the combination of temperature time series. Remember different thermometers can experience two primary effects. Offset of temperature due to altitude or proximity to water etc. and different levels of seasonal variance, proximity to water, dryness of air, etc.. The “hammer” method takes care of both seasonal variation and offsetting values to provide the best match between series. 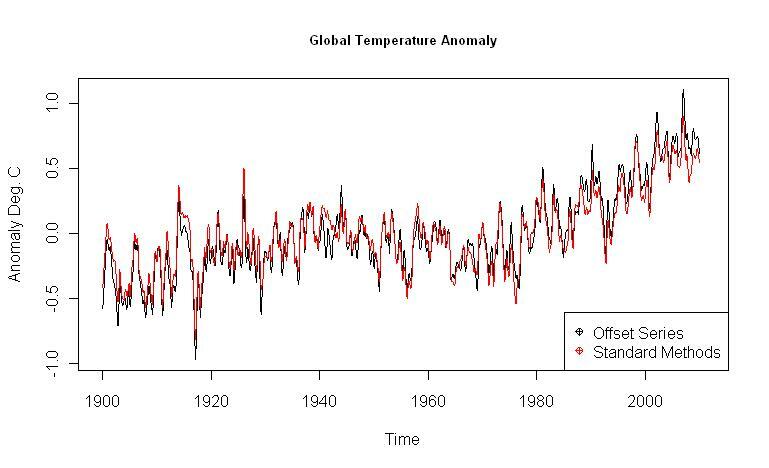 A second and independent improvement from Roman’s recent work means that we no longer need to calculate anomaly in order to solve for global temperature trend. I don’t think I signed this petition but the government response to it is pretty interesting. Jean-Francois Cope, parliamentary leader of the governing UMP party, was quoted as saying the tax “would be Europe-wide or not (exist) at all”. Prime Minister Francois Fillon told parliament that the government should focus on policies that increased France’s economic competitiveness. It’s good to see a bit of sanity in the world of crazy government. Not that the current US administration would mind carbon taxing itself into obsolescence. Take it from our European friends, CO2 limitation is a horrible idea, unilateral CO2 limitation is just dumb.